The Golden Bell Collective is made up of a crew of top DJs and musicians from the Bay Area and Los Angeles. Outside of DJing private events and parties, you can find us performing our original music or touring with top artists such as Bonobo, Pretty Lights, Talib Kweli, Gramatik, Beats Antique and Afrolicious to name a few. By booking as a collective, rather than individual artists, we’re able to pool our collective resources and place these top DJs and musicians at private events and weddings who would otherwise be unavailable. In fact, many members of the collective are only able to pursue full-time careers in music through the support of the events Golden Bell has been able to provide. By hiring the Golden Bell team for your events, you’re directly supporting artists and musicians in your community. 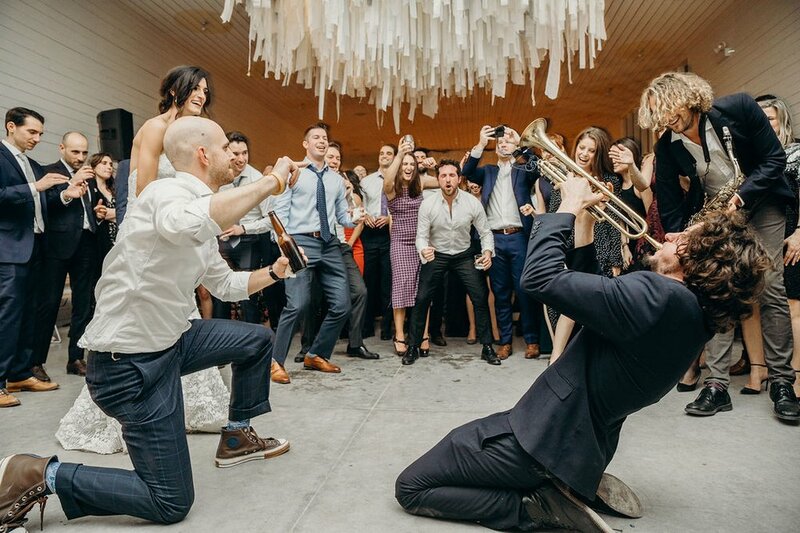 Will Magid: DJ / Trumpet Player / Producer Will Magid's music is always a joyous affair. His unique style of live performance and electronic sampling seamlessly blends music from across the globe. Will has had the honor to tour and collaborate with many talented artists from diverse genres of music, such as Talib Kweli, Gramatik, Bonobo, Solomon Burke, Erykah Badu, Pretty Lights, Kenny Burrell, Zigaboo Modeliste, and Baba' Ken Okulolo. Will Magid is Golden Bell's Co-Founder and Chief Trumpet Officer. Chris Hoog: As a DJ and artist, Chris Hoog blends a wide range of music from funk and soul to hip hop and house while supplementing his sets with subtle horn lines or tasty solos which adds a mix of musicality and surprise to the dance floor at clubs, weddings and private events. Chris's saxophone playing has a lyrical tone and quality that compliments whatever music is in the mix. Chris plays is active in a number of touring acts, including Afrolicious and Cassandra Lewis and the Foxxtones, and has played top artists and bands including Beats Antique and The California Honeydrops.